This hair transplant procedure involves removing healthy hair follicles directly from the scalp and grafting them into the bald areas of the head. Using the latest techniques, this allows our hair transplant specialists to do larger FUE sessions than before and harvest is maxim amount of hair follicles in the minimum amount of time. No stitches and no aftercare guarantee that clients can get back to work the following day. 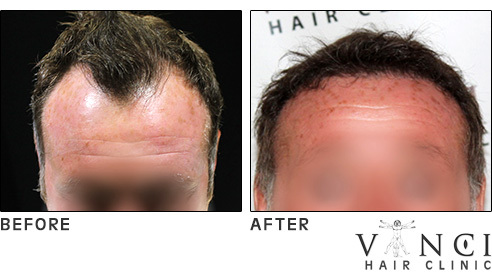 The Hair Transplant surgeons of Vinci Hair Clinic have over 18 years of combined experience in FUE (Follicular Unit Extraction) Hair Transplants – and are some of the best Hair Restoration specialists in Europe. FUE Hair Transplant – When Will The Results Show? You will be able to see the outline of your new hair line immediately after procedure. 6-12 months later, the transplanted hairs will have re-grown fully and the bald patch or receding hair line will have disappeared. The results will be totally natural-looking and permanent.